'Hello Tractor' Aims To Solve Tractor Shortage In Africa With Affordable, Easy-To-Rent Minimachines : Goats and Soda A city boy came up with a great idea for farmers in Africa: a mini-tractor that costs only $4,000 and has cool digital features. Hello Tractor's machine can plow and text. At the trendy South by Southwest conference in mid-March, there was buzz about music, movies, President Obama's keynote address ... and tractors. Why? Because there's a new, low-cost (but pretty smart) mini-tractor that's part of a business start-up in Abuja, Nigeria, called "Hello Tractor." And it was part of a SxSW competition. What makes the tractors smart? Each one comes with a GPS antenna. So when the tractor has been used enough to need maintenance, Hello Tractor will alert the owner. Even better, the company can use data on tractor location to play matchmaker. If a certain farmer needs a tractor, the company can contact the nearest tractor owner, who'll ride over and, for a fee, perform the services needed on the neighboring farm. The idea is so bright that the company founders raised $3 million in seed money from USAID and other sources. 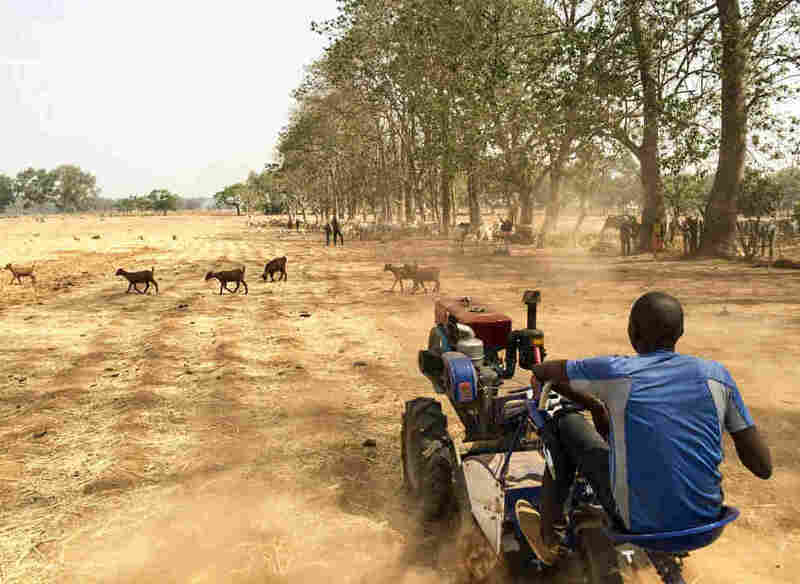 And so far they've sold 1,000 tractors to farmers in Nigeria at $4,000 a machine. The entrepreneur behind Hello Tractor is a city boy: founder and CEO Jehiel Oliver, 33, from Cleveland, Ohio. He's got a masters in economics from Cornell University. His life story doesn't exactly scream "agriculture." But a couple of years ago he became interested in the problems of the global poor, who earn much of their income on the farm. And he noticed that "most banks didn't lend to farmers." So the idea of a cheap tractor captivated him. It fit with his lifelong goal of wanting "to make a difference in the world." When he talked to his wife and some friends, he thought they would probably dis the idea as some "kumbaya" thing. Instead, the group embraced it. They researched Nigeria and learned that it's the most populous country in Africa with agricultural lands as vast as Texas. They also learned that, yes, an inexpensive tractor can be life-changing. Tractors can plow in hours what a crew plows in days, so a farmer with a tractor can plant early enough to take full advantage of the rainy season, bringing better yields. But first farmers have to be able to afford the tractor. So instead of thinking big, Oliver thought small. "A typical entry-level tractor in Nigeria is 55 horsepower," he says, "Ours is 15. [The] 55 horse power tractor [costs] around $40,000. [Hello Tractor] is $4,000." Oliver shared those numbers at SXSW's Global Innovation Challenge, a pitch competition that he won. Part of the deal is that he now goes on to attend President Obama's Global Entrepreneurship Summit in June. Why are tractors so important in Africa? Calestous Juma is an expert. Not just as a Harvard scholar. But as a native Kenyan. When he was growing up, his family rarely went grocery shopping. They fished and harvested their food by hand. Now at Harvard's Belfer Center for Science and International Affairs he leads the center's Agricultural Innovation Policy in Africa Project. His research shows there's a huge tractor shortage in Africa. Worldwide you can find an average of 200 tractors every 100,000 square kilometers (roughly 70,000 square miles). In Africa the average is 13. And tractors are very helpful, although they have their pitfalls. "Tractors are very controversial in the developing world [in general] and in Africa [in particular]," Juma says. On the one hand, they can help small-scale farmers plant on time in an efficient, cost-effective way. And if the farmer doesn't have enough laborers, the tractor is invaluable. In places where there are laborers, however, tractors get the blame for taking workers' jobs. Tractors also need maintenance and spare parts, which are not readily available in much of Africa. So imagine you are a farmer who has saved, possibly for years to buy a tractor. What do you do when the tractor breaks down? Because it will break down. "It takes only one piece," Juma says "and then you can't use the rest of the tractor." In some parts of Africa, it can take months to get your hands on a spare part. Hello Tractor's Oliver says his company is trying to fix that. If a part breaks, farmers can use the tractor's Short Message Service and text message Abuja headquarters to buy a replacement. If Hello Tractor gets some traction, its potential is huge. Last year the Tractor Owners and Hiring Facilities Association of Nigeria reported a shortage of 73,000 tractors for the country's agricultural activities.